When I was 17 I started work at Myott Meakin. I worked in the glost (glaze) warehouse on a sorting machine. When the plates go through the glost kiln they are put on a crank (a shelf like construction with pins which raise the ware from the base to prevent adhesion). Ware which has come off the crank has a glost mark left behind, a blob of glaze, as sharp as a needle. It has to be removed – and that’s what the sorting machine does -- it smoothes it off. Because the machine revolves you can only do circular ware -- oval dishes have to be ground by hand. I worked with an old man called Horace. I put the plates on and Horace took them off. There were many members of the black minority ethnic community at the factory. There was me, my brother Younas, my other brother Yousaf, and my cousin Kusar. I liked it at Myott. I had an accident though. I used to do a lot of overtime. I was working one weekend unsupervised, when I got my arm stuck in the board washing machine. In the dipping house, after the glaze was applied, the ware was placed on a board to be taken down to the kiln. After a while the boards got dirty, and had to be washed. There was a machine for the job. I was walking past it, with water and glaze all over the floor, when I slipped. My right hand went inside. The rollers dragged it in and I couldn’t get it out. The isolator was 20 yards away - too far away for me to do anything. My elbow prevented the arm going in any further, but my wrist stopped it from coming out. I shouted and shouted to my brother to turn the machine off. It took 45 minutes and an iron bar to extract it. When I got to hospital, the nurses said they had never seen anything like it - I had a terrible friction burn. It was three or four months before I could go back to work. When I came back I was given a different job. I was put on sweeping up. I did it for a couple of weeks, and then I was moved into the dipping house (where the glaze is applied). 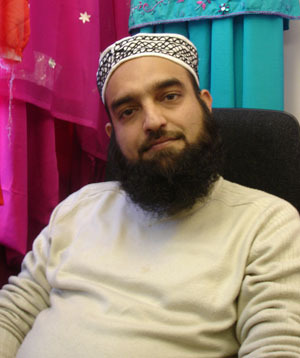 My manager was a member of the black minority ethnic community – he was called Muhammed Benares. First I did dipping, then I was put on the glaze spray machine. It was my job to remove plates from the back of the machine. It was a job that required some skill – you had to know how to handle the plates, or you’d damage them. In 1991 Churchill took over Myott Meakin. I remember a voice coming over the tannoy: ‘Hello, I am your new General Manager Mr Drayton’. I always got on with everyone there actually, but Churchill made big changes. They moved everything about. In a way the changes made sense, things were organised more effectively, but something was lost too. Under the old system the ware could be shaken and broken as it was taken from the dipping house to the kiln. The factory was reorganised so the dipping house was right next door, there were no more stairs, or boards. Then they stopped using dippers too, and just used the glaze spray machine. They stopped using crankers – people who put the ware onto the cranks. Machines did it instead – and more efficiently than people. The output told a story – ‘seconds’ dropped and ‘best’ increased. Churchill decided they wanted everyone to work shifts, but I didn’t want to do that, I am epileptic, and I was frightened about the effect of shift work on my fits. My doctor thought it would be dangerous, and he wrote to confirm what I told them at work. So I was put back onto sweeping again. I didn’t find this any hardship, I loved it. They would say ‘Mirza, go and clean up this, or that’ and off I went. I was given eight-hour shifts, but it wasn’t hard work. I was even given a new cleaning machine. After a while I had a new General Manager – a really nice man called Mick Laverick. And he got me working in the once-fired department. I was a foot-wiper, then a swiller (someone who swills the glaze inside a pot). Eventually I left to work for the Racial Equality Commission. I went back to see them – I always got on with everyone there. They said ‘What the bloody hell has happened to you? Mirza in a suit with a briefcase!’ The truth was, I always wanted to better myself. Churchill was certainly efficient, but I think I liked it better at Myotts.